In the last blog post, we talked about overall conservation practices in Mount Robson Park, specifically protecting the headwaters of the Fraser River. For this post, we want to continue to the conservation theme by writing about wildlife conservation practices at the park. Nature is not only about scenery, it is also about a place where ecosystems thrive and a variety of species survive. To date, 42 species of mammals, four amphibians, one reptile (I wonder what it is!) and 182 species of birds are recorded as residing in the park. These are typical species of the moist, western slope of the Rocky Mountains. From Moose who graze the valley bottoms to the Mountain Goats and Golden eagles of the Alpine Tundra Zone, all four bio-geo-climactic zones within the park provide habitat for species whom have adapted the unique characteristics found in each zone. Some animals, like the Grizzly bear or Mule Deer, find suitable habitats in multiple zones or elevations. Excellent opportunities for wildlife viewing are available on a drive through the highway corridor in late Spring. Park staff have observed Mule Deer, Whitetail Deer, Moose, Elk, Wolf, Coyote, Black Bear, Grizzly Bear and a large variety of waterfowl. In the spring, Elk mothers (cows) become extremely protective of their new calves. Moose and deer will also actively defend their young but Elk seem most prone to short tempers when confronted with anything they perceive as a threat to their young. In the fall of the year its the male Elks that can become aggressive. The “mating or rutting” season in September and October can make even the most seemingly docile Elk, Moose or Deer aggressive. Although they are beautiful, give all wildlife the space they need to ensure their safety and yours. The best way to observe wildlife close up is with binoculars. A number of the valleys in the park have no routes or trails and extremely low levels of human use. This is in keeping with the belief that “wilderness” means wild and the Grizzly Bears, Caribou, Wolverines and other wilderness-loving species seem quite happy to keep it that way. We love the wilderness, just like you do. 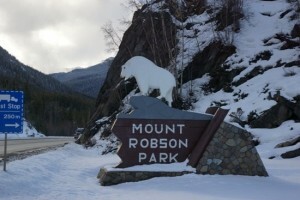 That is why we offer the accommodations closest to Mount Robson park. Come and visit us this spring.